A few weeks ago I expressed my displeasure and disgust with my Windows machine, particularly its chronic requirement to update at the most inconvenient times. I’m still using said machine, but for music and photos only. That may change soon as well. However for writing I’ve chosen to use a Chromebook. Most of what I do is on the web and a lot of it is in the Googlesphere so it made sense for me to go with the Chromebook because I knew everything would work seamlessly, play well with my other devices and it came with ports for me to plug in anything else I may need. The next decisions were size (11″ or 14″) and brand. The size question was easy. I wanted something small and light that would fit in just about any bag. The 11″ filled that requirement. I was leaning toward the H-P but read (repeatedly) that there had been a problem with the charger and that the HP 11″ had been pulled from retailers. It has since returned but with my nerves reaching the fraying point and not wanting to wait I went with Samsung. Their products are familiar and their Chromebook placed better in reviews than the Acer version. Writing – All blog drafts are written in Evernote most other docs are created on Google Drive (except when working with other Windows/Microsoft users). Evernote and Drive can be used on all my devices and I was starting a lot of blog posts on my phone anyway so the Chromebook made it more convenient and comfortable. 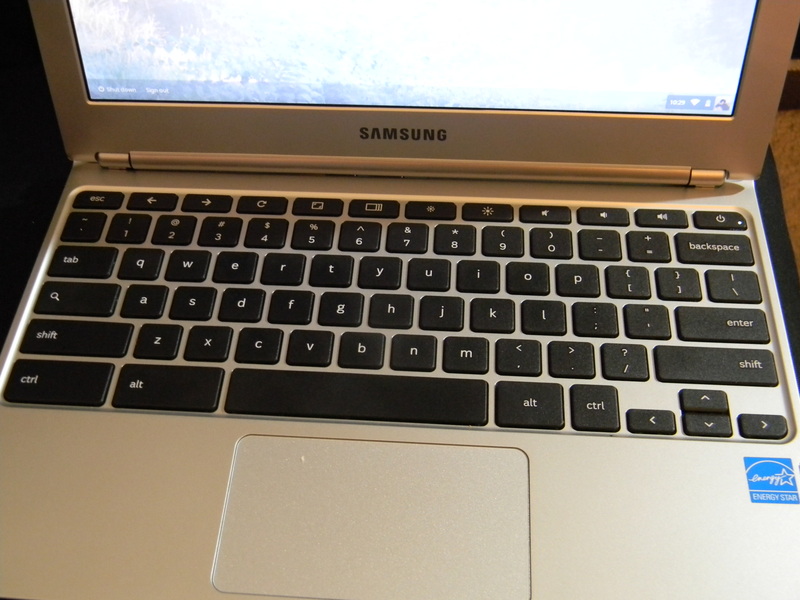 Photos – I don’t do much with photos on the Chromebook except add them to blog posts. if the photos were taken on a camera I pull and edit (if necessary) on my Windows machine, if there is no editing photos are uploaded from the SD card to Google Drive and pulled into the blog. it’s pretty convenient and simple. Video – I have watched a few videos on the machine and was underwhelmed. I don’t know what the resolution is on the Chromebook but the colors are not dynamic. 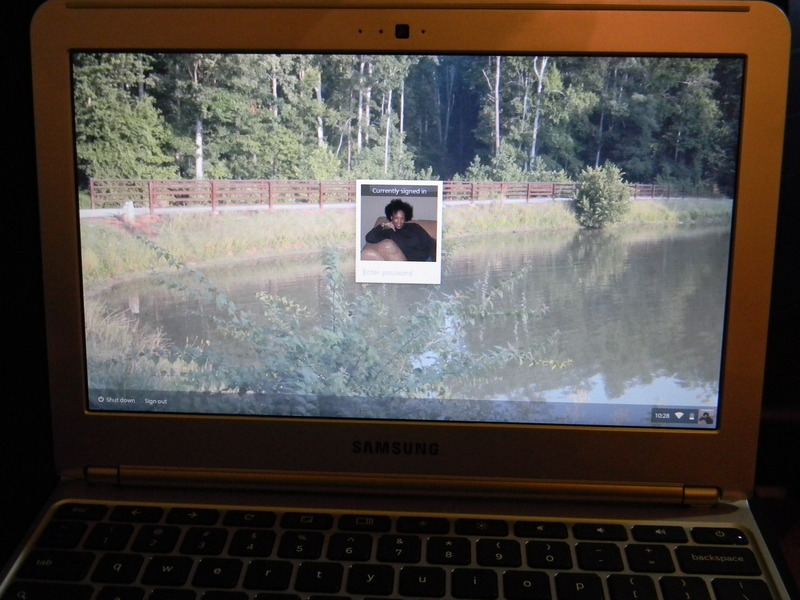 However for Exercise video I use the Chromebook exclusively. I workout in the morning and have ZERO time to wait on my Windows machine to do all that syncing and updating. I open the Chromebook, sign in, click YouTube and start working out. It’s a beautiful thing. When I first used the keyboard I was a bit annoyed that the delete, end, home and caps lock buttons are non-existent. That was fixed by Googling the keyboard shortcuts of which my most frequently used is “delete” which is alt+backspace. Additionally using a web machine requires some organization in terms of files and workflow. I’d been subconsciously prepping for the move to mostly web-based work for a couple of years so it wasn’t a bad transition. However if you’re heavily dependent on local files you’ll have a bit of work to do. I highly recommend the Chromebook for writers. It’s so simple, fast and convenient I really wouldn’t think of writing on anything else especially if the majority of that writing is web-based and you want to spend your time creating instead of waiting. Do you work mostly on the web or are you a writer? 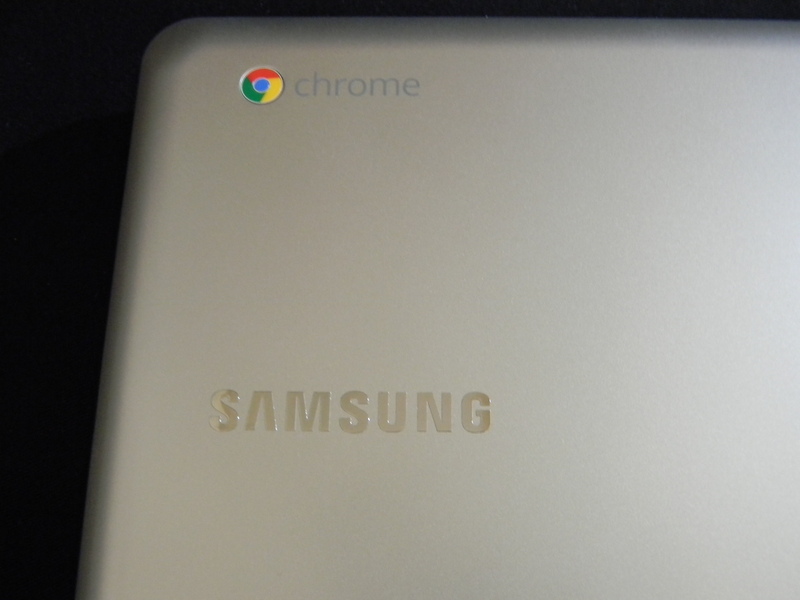 Do you use a Chromebook to meet those needs or another machine? Let me know in the comments, Twitter or Google+ and let me know your experiences. This is what happens when you spend the better part of the day in bed, sick. You find ways to either complicate or simplify your life. My hope is that I ended up on the simple side. What am I trying to do with my content? Do I want all of it in one place? If so where and what do I call it? What is it called? Do I want to pay for it? The decision was that I wanted one place that aggregated my content only. A place that I could send people to that shows content that I've written and content that I shared and THAT'S IT! My Twitter stream, and Facebook is really social and having all of that in the stream was really messy. That said I did want the remainder (my blogs and Google Reader shares) all in one place (which answers question 2). What I wanted was a Lifestream, more specifically a shared content stream. I read about Lifestreaming and about moving to the "lifestream" since blogging is "dead" and all, but for me and plenty of non-technical folks who just write and share, blogging is far from dead. d. One way for people to get a glimpse at your work, and other items of interest to you in the webosphere is to aggregate it. I decided to head back to chi.mp one more time. I didn't even remember nor have record of my password and after resetting that, deleting and re-ordering my "services" I'd like to introduce to some and re-introduce to others: thesoulstreetscribe.mp . I could have used Posterous or Tumblr or even WordPress to aggregate my content but chi.mp is so simple. You just pick a name for your site, complete your profile, add services and you're done. No expertise, only content required. Chi.mp has a pay service in which you buy the site, I decided against it for now. Who knows one day I will eventually learn WordPress and put it all there but as long as chi.mp is up and I can stream content there without touching it, I'm good. Do you Lifestream or have an activity stream of your web activity/content? If so I'd like to hear from you. Let me know what works best for you and of course, since I'm not an expert, let me know about the level of dificulty in using your recommended service. The budget minded non-tech person that I am has decided to run her iPhone until the wheels fall off. I am still new at this iphone thing. As a converted Blackberry abuser I bought the cheapest iPhone model possible at the time (12/09) a 3G and have been pleased with the phone but not the service. Since June I've loaded a bunch of apps and been pleased with one and woefully disappointed in others which I guess would be the case with so many to choose from. Now I've got them narrowed down to the most used. What I was missing was a mean to publish longer form blog posts by phone. The first experiment is this post right now via the free (of course) Typepad app. Why Typepad, why first? This blog was originally hosted on Vox, which shuts down 9/30/10. I planned to convert to Posterous but couldn't get it to work. The Typepad conversion was instant, maybe because they are both Six Apart products. Some folk may scoff at writing full on posts by phone, I'm good with it though. The way I see it I'd much rather strike while the creative or story iron is hot with the most readily available tool then chance losing the thought on my way to the laptop. Do you blog by phone? What apps do you use?